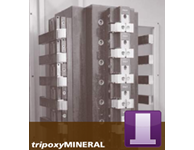 Modular Workholding & Fixturing Components (TRIAG) | Advanced Machine & Engineering Co. Benefit from maximum modularity with the quick-change TRIAG system that adapts to a standard 2.000” grid. Featuring a patented one of-a-kind interface that combines a consistent base rail foundation with an endless supply of modular components for nearly any job, AME is proud to be the exclusive provider of TRIAG products in North America. 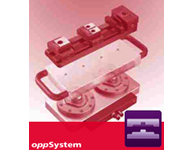 A modular clamping system in which a rail serves as basis for more than 180 different clamping modules, centric clamps, blanks modules, vacuum modules and magnet modules. 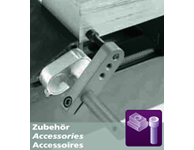 It is a mechanical zero-point clamping system as well as a vice. Inch or metric spacing. 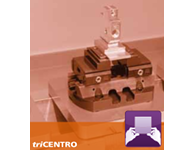 Triag offers a wide range of flexible, self-centering vises with compact construction that protects against contamination. Designed to fit onto the rail systems for powerCLAMP, aptoCLAMP, or the zero-point system OPPsystem. Also available as a mechanical self-centering vise. 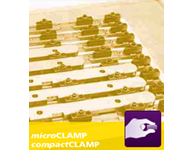 MicroCLAMP modules are well suited for fixture construction, which include a pull-down jaw on the front. The rear side is ground accurately to the size of the fastening bores, allowing the stop surface to be used for the subsequent workpiece and allows for an extremely high clamping density. 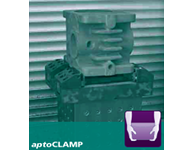 Achieve maximum clamping force in a modular quick change system with the heavy-duty aptoCLAMP. Stable, sturdy construction with positioning by ground teeth serrations every 2mm. Ensures precision clamping with forces up to 15,555 lbs. Inch or metric spacing. 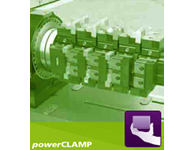 Zero-point clamping for quick and exact positioning that minimizes idle machine time. A pallet carrier mounted on the machine table and at least two pallets or workpiece carriers equipped with centering and clamping bushes make it possible to quickly (within seconds) exchange the pallets. Exchange pallets manually or automatically. 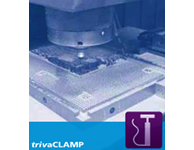 Gently secure flat or non-magnetic parts with the trivaCLAMP vacuum system. Vacuum clamping is suited for gentle and even clamping of bulky workpieces, plates, U-shaped or angle sections and thin-walled workpieces. Pressure marks and deformations that come with mechanical clamping can also be avoided in this way. This unusual method of workholding is suitable for irregular, fragile parts that are very difficult to grasp. 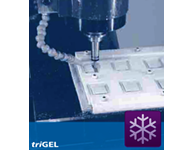 TriGEL achieves clamping without part distortion by freezing the workpiece to the machine table, while a heating pump thaws the workpiece for quick removal. Customize your Triag system with a wide range of add-ons and accessories for powerCLAMP, aptoCLAMP, and microCLAMP.